In Malaysia and other countries I often visit, I have experienced and seen things which is not the norm in my own country of the UK, that is not in the British culture, or is not contained in my belief system. I have had to learn to accept with an open mind new things presented to me as I travel. Today I saw what I would have presumed was a grasshopper, but this creature had different markings that I have never seen before. I have seen green grasshoppers, light yellow grasshoppers and more, but one with not such a dark brown with white markings. But then, perhaps I do not know everything about grasshoppers. I teach in NLP, we only know what we know, or want to know, and that is the world we live in, our belief system. Anything that does not fit into our existing or previous knowledge, learnings, what we have been taught, our understanding of our own small world would be strange, incorrect, and we will distort any new experience to fit into our existing understanding of our world. Yet, obviously this creature was in existence prior to my seeing it. Just because I was not aware of it does not say it did not not exist. We should all open our minds up for new possibilities, accept that a belief is just a belief based upon what we have been told by others, and we all have different beliefs. Which or whose belief is correct? We will never know until the lights go out. 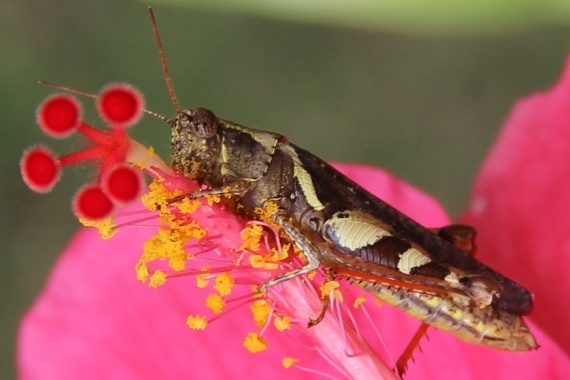 So until I am told differently, this is a grasshopper.